H. Chervis Isom, senior counsel in Baker Donelson’s Birmingham office, has joined the Alabama Writers’ Forum board of directors. 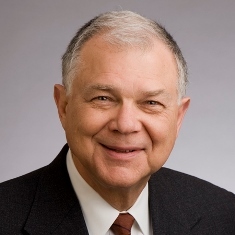 A graduate of the Cumberland School of Law of Samford University (1967) and Birmingham-Southern College (1962), Isom formerly served as Chair of the Real Estate Practice Group. During the 1960s, Isom taught at the Boys Industrial School, now the DYS Vacca Campus, where Tony Crunk teaches the Writing Our Stories curriculum. Over the past thirty years, Isom has assisted many of the leading developers in the South in developing, leasing, financing, and disposing of commercial real estate properties of all kinds, including retail and mixed use properties, office, industrial, business parks, and multi-family projects. During past years, he headed the legal team for a large department store in its expansion, negotiating at least twenty transactions with major enclosed mall developers, including ground leases, build-to-suit leases, and fee ownership transactions. His many honors include Band One of Chambers USA: America's Leading Business Lawyers (since 2003), The Best Lawyers in America®, Real Estate Law (since 1987), and Best Lawyers in America "Lawyer of the Year" in Real Estate Law for Birmingham (2010). A member of the Norton Board of Advisors at Birmingham-Southern College, Isom also serves on the boards of Norwood Resource Center and Birmingham Arts Journal. He is vice president of the board of Four Spirits, Inc..